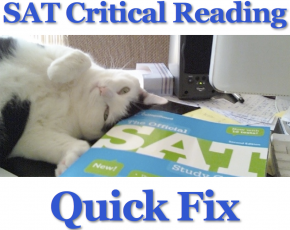 Should You Hire an SAT Tutor? You are here: Home / Key Posts / Should you hire a tutor? Hiring an SAT tutor is not for everyone. It’s a big investment of time and money. Quite frankly, not every student will make the most of the opportunity. Not every student will put in the effort that it takes to succeed. Before you decide to make that investment, ask yourself honestly in your heart of hearts, “Do I have a kid who says he wants something but doesn’t put in the effort to get it, who quits when things get hard, who’s always making excuses and never takes responsibility? There’s no question that when a student does put in the effort, it can result in a huge increase in his SAT score. Let’s examine a few reasons why hiring the right tutor can make a big difference. 1. It’s hard to get into a good college today. The number of applicants to the most desired schools has gone up dramatically in recent years. The number of students being admitted has stayed fairly constant. Many of the top private and state schools are reporting record low admissions rates. Are you considering a top public university? In the spring of 2009, UCLA admitted only 21% of its applicants, the lowest rate of any public university in the country. UC Berkeley wasn’t far behind with an admission rate of 23%. Considering a top private school? Some Ivy League universities had admission rates of less than 10%. The top small private colleges had admission rates in the teens. 2. You’ll pay as much, if not more, at many mid-ranking private colleges and universities as you will at the most selective schools. In a recent study of the cost and quality of a college education, Malcom Gertz, a professor of economics at Vanderbilt, found that the price of tuition is not directly associated with the quality of education. In fact, the most selective colleges offer the most financial help. 3. Projected lifetime income for students at the most selective colleges and universities is significantly higher than it is for students at less selective universities. According to Caroline Hoxley, a Stanford based economist, the average difference in projected income is $1.2 million. 4. Higher SAT scores mean a greater likelihood of a getting a merit based grant or scholarship. 5. Perhaps most importantly, a significantly higher SAT score increases the likelihood that your child will get into the school of his dreams. Choosing a college is an enormous decision. Better SAT scores mean more choices. Now more than ever, the stakes are high. Test preparation isn’t just another educational expense – it’s an investment in your child’s future. Of course, when it comes to choosing a tutor for SAT prep, there are a lot of options. Here’s how to choose a tutor who can help your child get the SAT score he deserves. Hi what are your rates and is instruction via Skype?